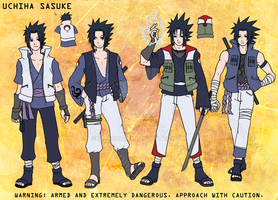 Kukuku... Sasuke with the longer hair and clothes for the In Memoriam project. Defiant and dangerous, the infinite wheels of the Sharingan spin on in the feathered serpent master! Wow, haha, I must be hungry since I've started to sound like a badly translated anime tagline. Oi, if you wish to use this elsewhere, please credit me. SRSLY. where can I read this In Memoriam ? 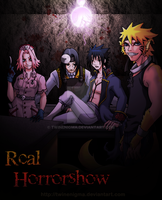 I haven't written it into a fanfic or anything - it's script format for the doujinshi. I don't know if I'll ever post it as a fic version. I was actually working on one. Hey! Don't know if u remember me but I was @ Anime Boston. I REALLY LOVED your work. It's simply amazing. 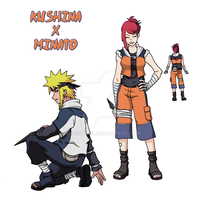 I bet if you show them to the creators of Naruto, there would definately be somethng to work with. Keep up the great work. I'll be in touch, I do have a commision in mind. Well, I probably did see you bopping around. Thank you very much. I'm flattered. but I can image it. Why does he look so feminine........? Because he has long hair and he has his mother's face. Now this would make for a nice sticker ! 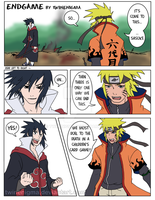 It's like the return of the Madara. Pretty freakin awesome. Like the ino one. Yay i can't wait to see them. Who are they going to be? Woot woot. Can't wait. 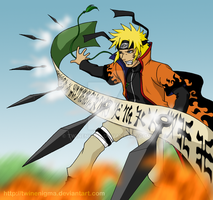 You show draw some of the akatsuki to. Hur, maybe Deidara. 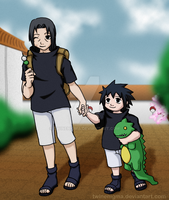 He doesn't look like he has the chicken pox when you chibi-ize him, unlike Pein. ......... Hhmm.... he needs an eye patch. Not according to the manga. But that's what artistic license is for. He's not nearly genocidal enough to be Sephiroth. Raiden - maybe. He's certainly godmoding enough. didn't we decide he was closer to cloud anyway? No, I said so because I am awesome and already knew that. *edit* I really like this design, I want to see the non-chibi version!!! oho looks very well done! Dude..... That tagline thing MAKES MY LIFE.